Not sure where I start this month as having just written down all that you have done this month I have a lot of notes that take up 3 pages!! So apologies in advance for those I miss off but I don’t want to put you off reading these reports again by writing it all down. A warm welcome to Leoni and Meera who joined up this month and started their Bentley debut on the second stage of Rodger’s Trail run at Friday Woods. A glorious morning and beautiful course organised by Rodger. Doesn’t appear that Leoni was put off after returning the following Wednesday when her group including Helene, Bee and Linzi managed to do an extra couple of miles to the majority of us. . Loving the fact that Meera joining the club means that on the website where it shows that she was the leading female scorer last year it has Great Bentley Running Club after her name now!! However she has managed a Parkrun pb since joining of 21 mins and 44 secs. I am sure that gets you a standard (will explain to you). The other lady who has joined for a few months but is now attending the club is Anthea and again she run her first Mickey Edwards coming away with a bronze standard. It has been quite a month for some of you. Caroline S has come away with a 10k pb and a Parkrun pb and that elusive standard is getting tantalising close now. Claire G continues to improve almost at every race with a pb at 10k and 5 mile. Both pbs on non pb courses at Alton Water and Ipswich 5 so I suspect that there is more time to be taken off these. Rachel Giles also came away from Alton Water with a gold standard and a new pb. Marion got paced by Michael for a gold standard at Colchester. Bee got a silver standard for the Colchester 10k and then improved the colour to gold at Mickey Edwards. Sam G returned to racing in style with a 5k pb on the Thursday and then a truly impressive 10k pb time at Hatfield Broad Oak. To put it in perspective, she ran a faster pace for the 10k race than she did for the 5k race. I think one of my favourite standards of the month was seeing Sandra’s face and her dancing feet when she got her silver standard after the Mickey Edwards after finding her confidence to push herself a little harder. Tricia finally got her gold standard for 5k after just missing on gold at Sudbury last month. Jennifer A who has only been with us a few weeks also bagged her first bronze standard. Others may not have got a standard but was great to see them coming back to fitness with some fine performances. 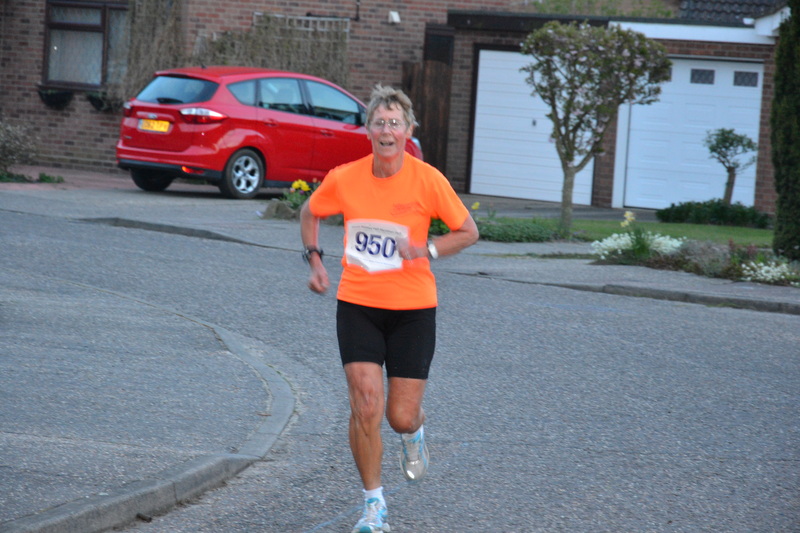 Eileen is returning quickly with a strong performances in 2 x 10k races in May and improving her times. Jennie Hipkin took on the Colchester Parkrun, not the easiest 5k course. Karen S run a strong race at both the Mickey Edwards and Friday 5 and is getting back quickly to full fitness. Cherie is also flying high in the points at the Harwich 5k along with Lesley who has found her speedy legs again. (6 miles). Not racing again quite yet but getting close to being fit again is Alison C and Hien. Will be great to see you back. Davina started off the month with a fab performance at the Sarsen Trail Marathon, an amazing achievement given that she was told 5 years ago that it was unlikely she would be able to run again. The Bentley babes did it in style for the women at the Halstead Marathon with an Essex Team Silver medal, a gold standard for Barbara in her age category and a bronze standard for Steph in her age category. The ladies team consisted of Steph, Miriam and Barbara. Emma T run a really strong race too. Steph run a pb taking off over an hour since her last marathon. What makes it all the more special was the awful conditions to run a marathon with temperatures of 19 degrees to contend with and an alteration to the course to make it hillier. Before I finish with Runner of the Month, a thank you to the social team for breakfast at the start of the month at Alton Water. A week earlier than Halstead but the weather couldn’t be more different. They had to endure torrential rain but still managed to feed us in style when Luke fathomed out that to cook on a camping cooker, you have to turn it the right side up. So, to my Runner of the Month, for the first time I am going to award it to someone who has already had it since I have been Captain due to their achievement this month. In what she says will be her last ever marathon at Halstead, she managed to get her diamond standard, an Essex Gold Standard and help the team to an Essex Silver Team Standard. The diamond standard means she completes the entire set of diamonds for her age category which is an amazing achievement at the tender age of 71 (sorry but felt your age had to be included…). Therefore, BARBARA LAW, you are once again the Runner of the Month. You are truly inspirational. Best Wishes everyone and see you soon. Mickey Edwards again this Wednesday……..